Property 7: Family-Friendly Santa Fe Home ~8 Mins to Downtown! Charming large Santa Fe home, pet and kid friendly! Property 24: Charming large Santa Fe home, pet and kid friendly! Sunlit Hills-SFe where the land plays with the light & the stars dance at night. Property 27: Sunlit Hills-SFe where the land plays with the light & the stars dance at night. New! Sunshine Home Family Friendly! Business Trips! Property 32: New! Sunshine Home Family Friendly! Business Trips! Property 39: Mountain Oasis Close to Ski Santa Fe, the Plaza and 10,000 Waves! 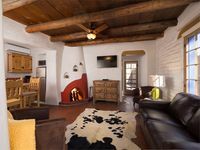 Property 41: Heart of Santa Fe Casita with organic amenities! Magnificent Home Set On 3 Acres 15 Minutes From The Plaza! Property 49: Magnificent Home Set On 3 Acres 15 Minutes From The Plaza! This is my second stay at this lovely casitas. It is beautifully decorated and has everything you need to feel at home. 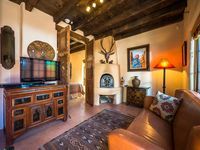 Truly has all the charm of Santa Fe and is in a great location to walk to the Plaza. Fantastic location and beautiful house for a nice getaway for my wife and I. Everything was equipped for a nice relaxing stay. Very easy and convenient. Would stay there again. Highly recommend.